From one local knitting group that knits at work, learn a few steps you can take to get started knitting with a group locally! I’d not have batted an eye if this woman said “I knit at work on my lunch break.” But instead she said “we…our” meaning more than One. Person. At. Her. Job. Knits! Folks, that got me intrigued! Tell me, wouldn’t you love to have a local knitting group at work? 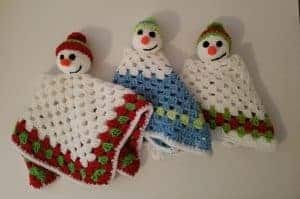 I knew I had to find out more, so I messaged Veronica Bonilla at her Facebook group page, Sweet Knittings, and begged her to let me send her some questions so I could learn the rest of the story. And here it is… the rest of the story! Veronica was not a knitter when she began working at an elementary school cafeteria. 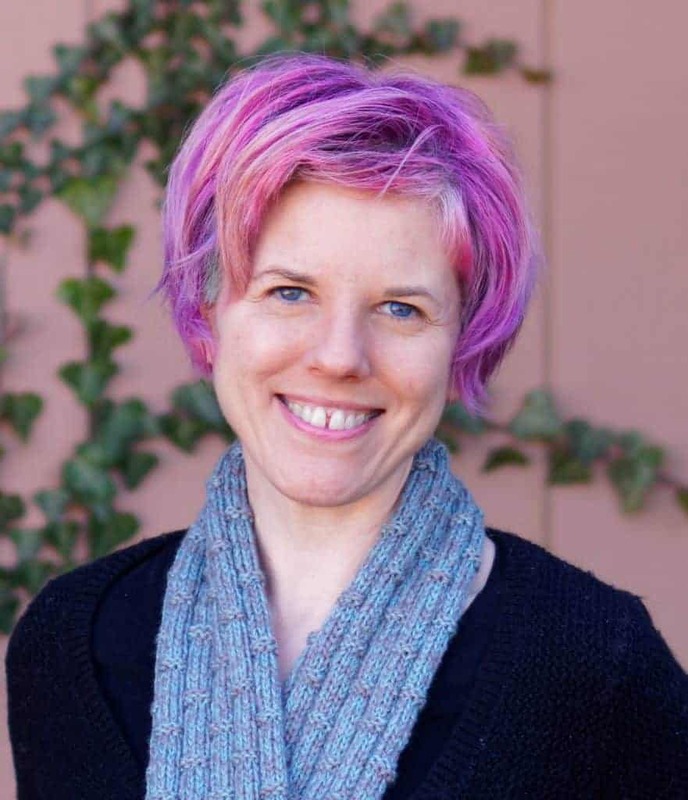 “A few years ago we were on our lunch break and a conversation started about knitting,” she said. “I didn’t know knitting at the time, so our manager Debbie showed me the knitting basics. “We once did a secret Santa for Christmas and the gift was to be a knitted scarf. That to me was a great thing because it was someone’s handmade work and made especially with care and so much thoughtfulness,” Veronica said. That was how their knitting group went from just a handful of knitters relaxing on their lunch break to a group actively knitting for charity. So not only does Sweet Knittings knit themselves, they also gather handmade donations others offer them. The group has had its share of growing pains, as anyone who has tried to knit consistently for charity will relate to. “One of the biggest bumps in the road we faced, besides learning the ropes and guidelines for different donation causes, was starting over,” Veronica said. “We originally started out as ‘Heartfelt Stitches.’ Then we learned that some of our pictures and info were being taken and used by someone else for their own purposes. We didn’t want to take any chances and decided to start fresh again. Like many charity knitting groups, Sweet Knittings decides what to knit based on what touches them. “For myself, angel babies and preemies are close to my heart, in memory of my brother’s baby, as well as cancer, as both of my grandmothers passed away from it.,” Veronica said. I love the story of Sweet Knittings because it shows how a local knitting group can develop organically and thrive! If you would like your own Sweet Knittings story, here are some things we can learn from Veronica’s story. 1. Become a knitting ambassador. If you love to knit, don’t be afraid to talk about it. Think about how Veronica started: with coworkers talking about knitting. If talking about knitting doesn’t come easily to you, you can try wearing some of your handknitted items. Wear a scarf, or fingerless mitts, or a shawl, or even a cell phone purse. You’d be surprised at how often I wind up talking about my knitting because of the cell phone purse I tote nearly everywhere! 2. Knit in public as often as you can. That’s another great way to spark conversations about knitting. As I mentioned earlier, I like to knit at my daughter’s swim practices. I confess I hear this often. Don’t follow my example and let it roll aside without comment! Pick up on it and say, “I could teach you, if you like.” You might find an eager pupil — and a potential knitting group member! 4. Don’t be afraid to start small. Sweet Knittings started with just a handful of knitters, but they’ve already begun collecting donations from others. Even if you stay small, you can still get the satisfaction of working together. 5. No need to force charity knitting right away. Maybe in the beginning, you’ll just want to focus on teaching one or two others to knit, or practice your skills, or — like Sweet Knittings — just creating things for each other. Once the group is comfortable with knitting and each other, then you can introduce the idea of knitting for others. I hope you’ve found Veronica’s story of Sweet Knittings inspiring! 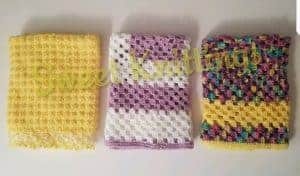 If you’d like to connect with their group, swing by the Sweet Knittings Facebook page. If you belong to a knitting group, how did it begin? Feel free to share your story in the comments! For more about starting your own local knitting group, check out this post! I love the name of Sweet Knittings. I’m in a small group at church who knit and crochet for charity. It was supposed to be a 3-month commitment, but we’re still getting together and working on projects over 2 years later. The women are amazing! We recently worked on the PURPLE hat project (for shaken baby syndrome) and are now doing hats, scarves, slippers, and lap blankets for a Christmas outreach for elderly people in our county. It’s so wonderful to help people with our gifts. That’s wonderful, Marilyn. Thanks for sharing! My knitting group, The Dayspring Stitchers, is a group of 9 ladies who knit, crochet and loom for friends, the veterans, charity, and mission trip groups I started the group because I wanted someone to knit and crochet with and now we have 4 different projects. 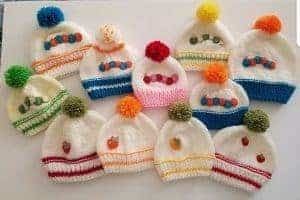 We make baby hats and booties, baby blankets, afghans, shawls, scarves, and adult hats and scarves. We are very busy and are able to contribute a lot. Some people give us yard sale yarn and others buy us some yarn when we really need help. We have a great time sharing and learning together. We meet on Tuesday from 10 AM to 12 AM at Dayspring Baptist Church in Mobile, Alabama. Originally I told everyone I would teach for free if they would contribute to charity. I have taught some of them, but most already knew how. Now they teach me, too. That’s wonderful. Thank you so much for sharing! What a wonderful group of ladies. I often see the knitters on my way to the restroom. I often say hello, but I always think to myself, “What a blessing to have this neat hobby and the consistency of this group.” They all look like they love what they’re doing. I think I would like to get a group of my co-workers, many of whom are now retired, to form a knitting/crocheting group. We can have fun and serve a purpose for those in need as well. Thanks Sweet Knittings!!! What a fun idea, Denise! I hope it works out for you!